We love a variation on a pancake (Carrot Cake Pancakes anyone?) but everyone loves the classic pancake. Here’s a recipe for just that. Make it when you want a people-pleaser, a tower of comfort food to bring people to the table fast. A little whole wheat flour enhances the texture of these simple everyday pancakes. For even lighter pancake, beat an additional egg white to soft peaks and fold into the batter just before cooking. In large bowl, whisk together the all-purpose flour, whole wheat flour, sugar, baking powder and salt; set aside. In another bowl, whisk together the eggs and milk. Whisk in the melted butter. Pour the wet mixture over the dry ingredients and whisk until just combined. (Do not over mix; a few lumps are okay.) Let the batter rest for 10 minutes. Heat a large skillet or griddle over medium heat; brush with some of the oil. Once the pan is hot, adjust the heat to medium-low. Using 1/2 cup of the batter per pancake, cook the pancakes in batches until bubbles start to form, about 1 to 2 minutes. Flip and cook until golden on the bottom, about 1 to 2 minutes. Brush the skillet with more oil as needed. Meanwhile, stir together the yogurt, icing sugar, vanilla, lemon zest and lemon juice. 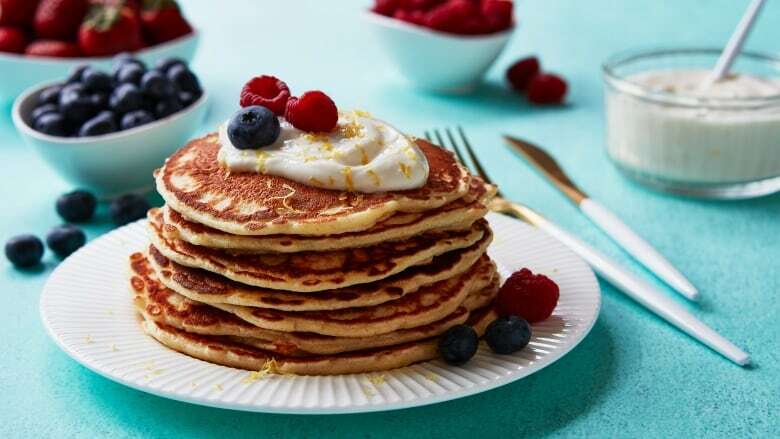 Serve the pancakes with dollop of the citrus yogurt sauce and berries. Drizzle with maple syrup if desired.